One week ago today, I exited the Wimenuche Wilderness after a weeklong backpacking trip. When I turned on my phone for the first time in a week, it blew up with texts and messages about the horrific shooting in Orlando at the Pulse nightclub. I had no idea what these texts were talking about, as I had been oblivious to the happenings of the world. A quick google search caught me up on the week’s tragic events, and I had a knot in my stomach trying to ponder what happened. Some of the messages I received were from Christians asking me how we, as Christians, should respond. My answer to that is simple. We weep. We pray. We love. A tragedy like this brought me to my knees in grief. While I saw many people respond with compassion, the response I saw from some Christians boiled my blood in anger. The response on social media that I witnessed from some Christians was complacency at best, celebration and bigotry at worst. They seemed to think these deaths were justified because of the apparent sin in the victims’ lives. But, because of truth we believe in God’s Word, our proper response should be weeping. Weeping for the loss of innocent lives. John 11:35 is one of my favorite verses. It simply says, “Jesus Wept.” Jesus wept at the loss of his friend. This verse shows us His love and His humanity. It shows us how precious life is to the great God whom made us and whom we serve. And our response to the loss of life should be no less heartfelt, raw, and real than that of Jesus’s. Even if our response isn’t hateful, it shouldn’t be any less compassionate just because of who the people were. Sometimes the church has responded to issues by staying silent, and that silence can be painful. The world is watching us, and how we respond reflects our heart for Christ and our heart for the Lord’s people. What should we pray about? Everything. We pray for the victim’s families. We pray for the survivors. 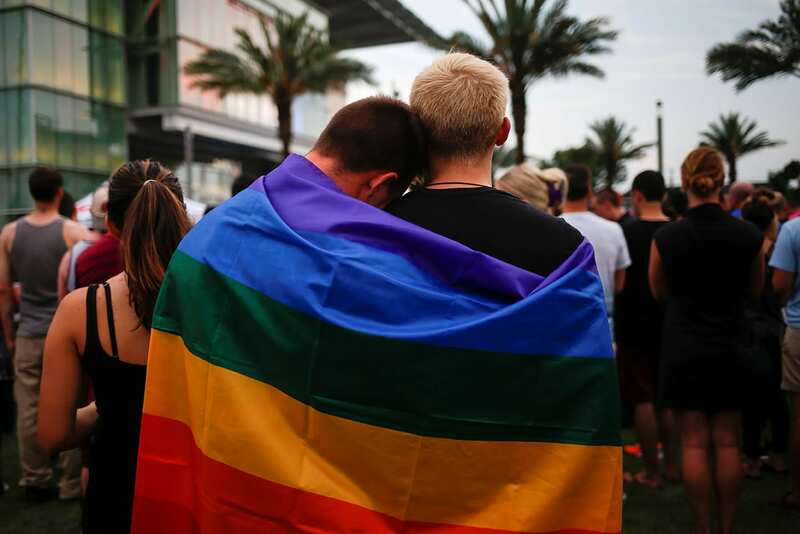 We pray for every LGBT person who felt heartache, confusion, and pain. We pray for ourselves, that we can show the love of Jesus to hurting people. Not pretend like they aren’t there or that it doesn’t affect us. But acknowledge that we live in a sinful, broken world full of pain. And that should bring us to our knees in prayer. Romans 10:1 states, “Brothers, my heart’s desire and my prayer to God for them is for their salvation.” That should be our prayer for the LGBT community. That they come to have a saving faith in Christ. And that we are obedient to playing our parts in their stories. We should be on our knees that these people, whom God loves, find the same saving grace that we found. Yes, it’s grace that they don’t deserve. But neither did we. We love. No matter how you feel about LGBT issues, our call is to love people. 1 John 4:18-19 states, “There is no fear in love; but perfect love casts out fear, because fear involves punishment, and the one who fears is not perfected in love. We love, because He first loved us. If someone says, “I love God,” and hates his brother, he is a liar; for the one who does not love his brother whom he has seen, cannot love God.” We all have LGBT people in our lives, whether we know it or not. How are our lives, our interactions, and our social media posts, all reflecting the love of Christ to them? We live in a day and age with the “topic of the day” and many people have moved on and forgotten about these events. But, many people are still hurting. They aren’t just people in Orlando. They’re our family, neighbors, coworkers, and facebook friends. Therefore we need to continue to love them well and point them towards our hope in Christ. How do we show the LGBT community that we love them? Put people ahead of politics. Put compassion ahead of debates. Show them that we are for them, not against them. Take steps towards them, not away from them. Lay down our lives for the sake of others. That is how Jesus loved us. And that is how he is calling us to live.